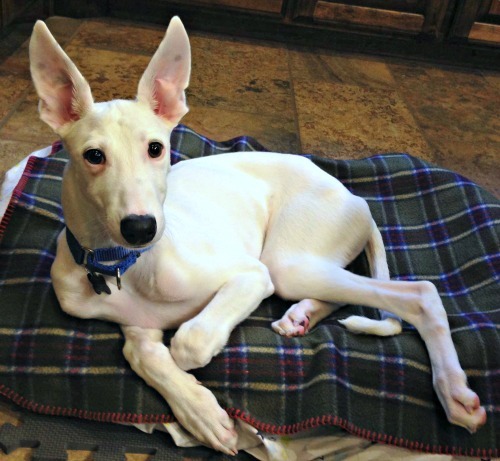 Helaku is a 4-month-old white male born approximately June 6, 2014. 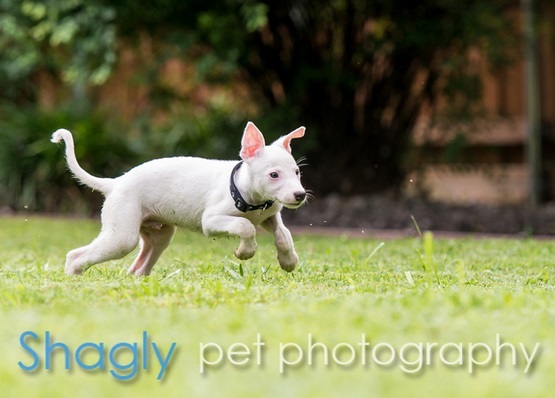 He was surrendered along with three of his littermates (Valentino, Petey, and Medley). and five older puppies from another litter (Christy Ellin, Riddick, Levi, Countess Aliesha, and Tyrion). All the puppies were thin and had intestinal parasites. Helaku was the runt of the litter and initially wasn't eating well. But he is thriving now! He has completed all his medical procedures and is ready to find a home! When Heluka first arrived, it was obvious that the tip of his tail had been broken, as it had a very pronounced crook at the end. Over the months, this caused him pain when it would get caught on various things. When he was neutered, his tail was amputated to about 3 inches long. From Helaku's namer: I would like to name the puppy Helaku (pronounced he-LAH-koo) which is a Native American name that means "full of sun" in representation of his little, though very bright spirit. The rescue of the Baytown Nine Puppies truly exemplifies the saying "It takes a village." Rumors had been heard that puppies were going to be released to a shelter in the Baytown area. Once confirmation was received locally and from as far away as Vermont, GALT made contact to get these puppies into a safe and healthy environment. Many thanks go to the local rescuer, Aliesha, in Baytown! She was told that the parents are greyhounds registered with the National Greyhound Association, but that has not been verified. Aliesha is still trying to get the adults turned over to her for spay/neuter.